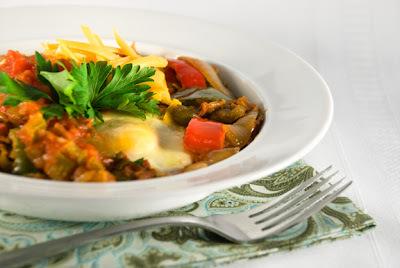 Here’s a simple recipe for a yummy egg dish that I make anytime I’m in a pinch for a healthy and quick dinner. Aside from a few fresh bell peppers, which if I were smart I would have chopped and frozen when they were abundant in August, all the ingredients are probably in your pantry and refrigerator right now. This recipe is a simpler, healthier take on the traditional classic Mexican breakfast which makes it the perfect quick dinner when you are looking for something light and satisfying. The key to this dish is a good store-bought jarred salsa. If it were August I wouldn’t hesitate to make my own fresh salsa using tomatoes from my garden, but it’s January in New England and the only fresh tomatoes you’ll find around here are mealy and devoid of flavor. My favorite jarred salsa to use for this dish is by a local company in Rhode Island called Pablano Farm. Full of flavor and complexity, their salsa is one of the best jarred varieties I’ve found. I buy mine at the Providence Whole Foods, but Pablano Farm also has a booth at the Providence Wintertime Farmers Market every Saturday morning and at lots of other farmers markets throughout the summer. You can use whatever brand is your favorite, just check the ingredient list and make sure it’s all natural and free of preservatives. *I use kidney beans, but black, navy, cannellini beans, or pinto beans would work also. Preheat a large skillet (preferably one that has a tight fitting lid) over medium heat. Add the olive oil, onions, and salt and sauté for 5 minutes. Add the peppers and continue to sauté until the vegetables are tender, approximately 10 more minutes. Meanwhile in a small bowl mash the beans with a fork until you form a chunky puree. Add the beans and ¾ cup of the salsa to the pepper mixture. Stir well and continue to sauté for an additional 5 minutes. Stir in ¼ of the chopped parsley or cilantro. Turn the heat down to low. Using the back of a spoon, make 6 wells in the mixture. Spray a little bit of olive oil into each well. Crack an egg into each of the well (or first crack each egg into a bowl to be sure not to get any shells into the salsa). Season each egg with salt and pepper and cover the skillet. Allow the eggs to cook until they reach your desired doneness. I like very firm whites with slightly runny yolks, approximately 7 minutes. Enjoy as is or with fresh tortillas, shredded cheese, lime juice, and sliced avocado. My favorite "international" cuisine is Mexican. I can eat it seven days a week and not tire of it. Surprisingly, though, I have never tried a true Mexican breakfast (not even for dinner). While visiting Mexico once, I had fish tacos from a street vendor for breakfast, so... I love this idea for either meal. Thanks for sharing and motivating me!